I copied this from Pastor Ken's blog. It's entitled "America cried for a king." "As the end draws near, there will be wars and rumors of wars. There will anxieties and fear and people's hearts failing for fear. The world will look to someone other than God to bring peace and prosperity back to normal. The world will worship false gods and they will follow a false ruler. They will be led by their delusion and their desire to be deceived because they do not want the one true God. Things will get worst." "God sent prophets to warn people of what would happen if they rejected God. God has sent His prophets who wrote God's warnings of what would happen if they turned away from Him and His word. The people did not listen thousands of years ago. They are still the same. They still refuse to listen." There is a story in II Samuel 8 where we see Israel demanding a king. God was not sufficient for them, so they asked for a "real king." They got an evil one -- Saul. America has been in a similar mood. We want a "king" to solve our many problems starting with the economy. So Israel said to Samuel, "Now appoint a king to lead us such as all the other nations have" (II Samuel 8:5). But all the other nations had pagan kings. God lamented to Samuel and said, "Now listen to them; but warn them solemnly and let them know what the king who will reign over them will do." Two years ago came a charismatic man named Barack Obama who was engulfed in a cult-like atmosphere. Some have actually called him "the messiah." Shrines were built to him. A Web site said, "Obama is god." There has been a messianic fervor, adoration and a worship-like atmosphere surrounding him. At some rallies people fainted at the sight of him. Young children recorded on YouTube sang songs to him stating he would change the world. There have even been sacrifices offered to him! The intrigue with this man is global. Newsweek magazine had a headline recently titled, "The World Hopes for its First President." Imagine, a world president! Newsweek states, "In country after country, polls show a record-high fascination with the outcome of the U.S. elections." Newsweek basically said "The international audience really cared less about John McCain, Sarah Palin, or Joe Biden. Somewhere along the road to the White House, Obama became the world's candidate." Newsweek continues, "Obama is a 21st century man with whom the whole world can identify." In Obama's speech in Berlin, Obama said that we are all citizens of the world! Talk about a message on globalism. Will he establish the one-world system? Probably not, but we can count on him to offer America's support in this endeavor. The next four years will be very interesting. America longs for a king to take care of us. We demanded change and change we will get! Of course along the way, something like 60 million Americans forgot to ask, "what kind of change and whom does it affect and how?" Hmmm, will America be happy with her "kingly" choice four years from now? Will his crown still sparkle in the night? Only time will tell. There are YouTube clips of people jumping for joy that Obama will take care of them. One person says, "Obama will pay my mortgage and buy my gas." The entitlement mentality reigns and it is cross-cultural. Jack Kinsella says in his recent Omega Intelligence Digest, "In October capitalism passed away after a long illness." He is right. Socialism now is very appealing and being implemented in America. The government is buying up many industries and turning them over to a new Socialist president! None of the candidates who ran in "Campaign 2008" can save us! Only the Lord God of Israel can do that! Will there be anyone who can stand up to the "king of change"? Will the loyal opposition stand tall when the time requires such or will they fold and push away from the table? Will America's citizens keep eating the pabulum of socialism or will they wake up in time? I am not sure what the outcome of this election will ultimately provide for America. But God"s word looks to be unfolding more and more before our very eyes! In Samuel's day, Israel declared that God wasn't good enough for them. In our day it appears our citizens have said, "God is not good enough for America." America's citizens may think Obama is a "messiah" but will find out quickly he is a very inexperienced leader with not much to offer except platitudes. They can call on his name all they want to, it will do no good! There is only one name that can change a nation or the rivers of society or cure the ills of humanity and that name is Jesus. Man has only weak opinions that are usually wrong. The Bible still has all the answers, the Holy Spirit is still active, God will still inhabit the praises of His people, there will still be room at the cross, Jesus will still save the lost, and Jesus will still set people free who call upon His name; not the name of Obama! "At the name of JESUS every knee will bow and every tongue will confess HE IS LORD (Messiah)." Praise His name He STILL REIGNS! In the meantime what will we, as the body of Christ, do? Are we going to put our heads in our hands and pout? Are we going to wring our hands in worry and fear? Are we going to moan and groan and complain? Here's what I think. This is our wake up call. Here is an opportunity for us to wake up, take our thumb out of our mouths, throw off the blanket of comfort and slumber and become what we should have been all along! We have mighty weapons at our disposal and they can bring down the darkness and the powers of darkness. We have the name that makes demons tremble and flee! We have power, not just power, we have THE power; the power of God! We serve the One who created the universe, the One who is the only true and living God and He said, "I will give you power after the Holy Ghost has come upon you!" We are more than conquerors through Christ! We are the church of the Living God and we have no reason to fear anyone or anything! No matter what happens in this world, we are victorious. Along the way, millions and billions of precious souls need to hear the message: the message of REAL HOPE and the message of TRUE CHANGE! Have faith in God. Read Mark 11:22-24 and Matthew 18:18-20. Come on church; wake up! Man up! Stop whining and stop sniffling! For this time and for this season you were created. Will you stand up or shrink away? Now for your freebies! Here are the first 6 of 30 papers I have made for you from my Great Smoky Mountain photos. Isn't God simply astounding in all the beauty He has made for us??? 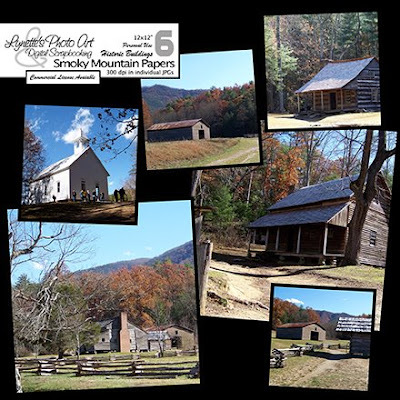 These six are of historic buildings in Cades Cove. Remember, these are for YOUR personal use only. Send people here to get them, don't share. Commercial licenses are available from Lynette's Photo Art if you want to use them to make money. Lynette, These pictures are gorgeous. I have been to Cades Cove and taken similar ones but it was a different season when I went. Your post is so true. Jesus is the only Messiah! Thank you! Your blog post will be advertised on the DigiFree Digital Scrapbooking Freebie search engine today (look for timestamp: 13 Nov [LA 09:00pm] - 14 Nov [NY 12:00am, UK 05:00am, OZ 04:00pm] ). I was only going to download 1 set of Smoky pics but couldn't stop until I had them all. Thanks so much for sharing with us. They are truly God's handiwork! !